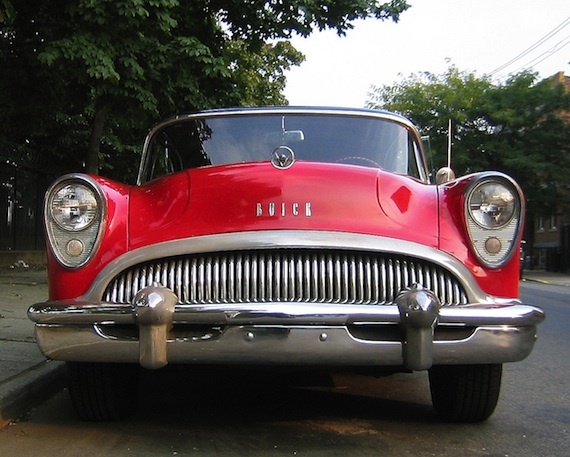 Behold the magisterial front end of the 1954 Buick: the toothy chrome grill, the sharply tipped mammiferous bulbs of the “Dagmar” bumper, the “bombsight” hood ornament, the tear-drop headlights, all of it wrapped in luscious lipstick-red sheet metal. This rolling work of art serves as proof, if any were still needed, that they don’t make cars like they used to. It has also served as the muse for all the fiction I have written, providing a way for me to travel, in comfort and at speed, into my chosen theme: the hollow promises of the American Dream in the years following the Second World War. Many people under the age of 40 have trouble believing it, but there was a 30-year period, from roughly the mid-1940’s until the mid-1970’s, when the United States of America truly had it going on. The economy was robust, the middle class was thriving, cars were big and fast and flashy and fun, and infectious pop music kept pouring out of Muscle Shoals, Memphis, Motown, and countless points in between. It didn’t last, of course. It couldn’t possibly last. The buzz kill ’70s brought Arab oil embargoes, military defeat in Vietnam, the trauma of Watergate, and the simultaneous decline of Detroit and rise of the Japanese auto industry. And then, to seal the deal, along came disco, followed by Ronald Reagan and the long, systematic dismantling of the American middle class. Those of us who lived through the so-called golden years of the so-called American Century tend to edit out certain inconvenient subtexts. There was the ever-present dread of nuclear annihilation; and if you happened to be a person of color, female, poor, or gay, there was (and still is) a good chance you were not enjoying a full share of the bounty. America’s swagger, it turns out, was built on flimsy hubris, a blinkered parochialism, and major inequalities. Oh, and cheap oil. Yet there is no denying that something magical happened in America in the three decades after the Second World War, and it’s not surprising that writers continue to mine those years not only for their exuberant hardware, but also as a measure of just how much the world has changed. Almost always, that’s a way of saying just how much we’ve lost. Timothy Walsh is the latest writer to revisit those expansive, metaphor-rich boom years. His third book of poetry is called When the World Was Rear-Wheel Drive, an automotive metaphor that establishes Walsh’s attachment to a time before today’s de-sexed, front-wheel drive, fuel-efficient hybrid cars, which is to say a time before our globalized economy and its computers and ruthless efficiency and digitized everything. The book’s subtitle is New Jersey Poems, and while there is a strong sense of place — the Jersey suburbs and shore, the looming allure of nearby New York City, that “oversize Oz” — the subtitle could also have been Rust Belt Poems, for these poems will resonate with anyone who lived in America’s industrial cities at their peaks, places like Newark and Buffalo and Cleveland and Detroit, places that suffered horrifically when America shed its rear-wheel drive past and American industry moved overseas, taking a way of life with it. and not get blasted by road wind. transistor radios, and fountain pens. the musk of new-mown grass. to check that the truck was actually empty. raining down on the river. ready to embark on another round of transgressions. intimate way and was now gone. Part of the past. Beyond retrieval. the vanished past could be vividly alive. When the World Was Rear-Wheel Drive is that certain hour of the night. It understands that loss is imminent and inevitable, and that the things we have lost are beyond retrieval. That’s what makes it so painful, and so lovely.